SEOUL/PYONGYANG, Oct. 4 (Joint Press Corps-Yonhap) — A group of South Korean government officials, politicians and civic and religious leaders visited North Korea Thursday to take part in an event to jointly celebrate the anniversary of the 2007 inter-Korean summit. A delegation of 160 people led by Unification Minister Cho Myoung-gyon and ruling Democratic Party (DP) leader Lee Hae-chan embarked on a three-day trip earlier in the day to Pyongyang, taking the western direct air route across the border. Following the approximately one-hour flight, the delegation arrived at an airport in the North’s capital and were greeted by Ri Son-gwon, chairman of the Committee for the Peaceful Reunification of the Country, and other North Korean officials. “Welcome to Pyongyang. This will be a pleasant trip,” Ri told the delegation, according to pool reports. “As we cannot imagine a tree without a root, the June 15, October 4, April 27 and September declarations in Pyongyang themselves … will serve as a standard for reunification,” Ri added, referring to summit agreements the leaders of the two Koreas have reached in 2000, 2007 and this year. On Friday, the delegation will take part in the first-ever joint event to celebrate the 11th anniversary of the 2007 summit held in Pyongyang between then-South Korean President Roh Moo-hyun and then-North Korean leader Kim Jong-il. The leaders adopted the October 4 Declaration after the summit, which called for the two Koreas to cooperate on building mutual trust, easing tensions and fostering inter-Korean economic cooperation. The delegation includes those from the art and cultural sectors and former President Roh’s son, Geon-ho. During their three-day stay, they will also tour major facilities and attend a mass gymnastics performance, which a ministry official expected to be short on propaganda and anti-U.S. messages like the one performed during President Moon Jae-in’s visit to Pyongyang last month for a summit. On the sidelines, Cho, who is in charge of inter-Korean affairs, is expected to meet with his North Korean counterpart, Ri Son-gwon, to discuss follow-up measures to the agreement their leaders reached in their September summit in Pyongyang. It is not clear yet whether the delegation will have a chance to meet North Korean leader Kim Jong-un. Later in the day, Lee, who also serves as the head of a private foundation honoring Roh, met with North Korea’s ceremonial head of state, Kim Yong-nam, to discuss inter-Korean exchanges at the parliamentary level. During his visit to Pyongyang last month, the ruling party chief proposed the holding of an inter-Korean parliamentary meeting within this year. “I’ll make efforts to pave the way for the two Koreas to fully communicate so that South-North relations could move away from confrontation and toward peaceful coexistence,” he told pool reporters before departure. The joint celebration comes after President Moon and North Korean leader Kim’s third meeting last month, in which they agreed to mark the summit anniversary with “meaningful” events. 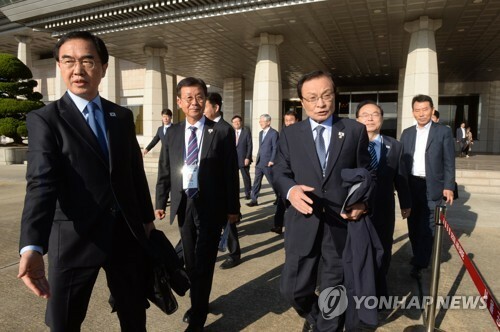 The Seoul government earlier said that it does not view the money to be spent on the South Korean delegation’s trip to the North as a violation of global sanctions on its regime, though it said that close talks have been under way with the United States on the matter. The trip is presumed to be costing the government up to around 280 million won (US$250,000), which will be paid to the North, according to the unification ministry.